If l you qualify in Texas there is a standardized qualification procedure as I guess there is in most states. 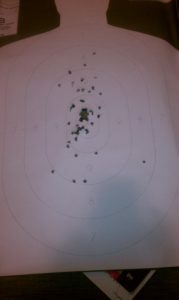 I gave my Aunt Brenda a little hint on passing her shooting test as she was a little worried about how well she would do. This will work for any of you shooting in Texas or other states with similar procedures. Just do the math. When you shoot at the 3 yard and 7 yard targets (the closest targets), be sure to take time to deliberately not just shoot at the whole target but take deliberate aim at the small center of the middle. Most folks, because each round of shooting is timed, get in a hurry and empty their pistols way too fast and put rounds all over the target. Shooters start from the “ready position”. From this position the pistol is already held out in front of you and only needs to be raised about 12 inches or so to fire when you hear the commence firing command. There is enough time to get a good sight picture. DON’T BE RUSHED. You should be the last one finished shooting within each time limit. When you are this close to the target, 3 and 7 yards, you should be able to practically/deliberately shoot a jagged hole in the center target ring and place all the rest of your 40 shots easily in the #8 ring which all count 5 points each (200 points total). Don’t get in a hurry and be deliberate with your aiming. The targets are very close, especially the 3 yard target so make a conscience effort at aiming at the center ring. When you are stepped back to the 15 yard range to shoot your last 10 rounds which is a more challenging, you can practically shoot those rounds in the dirt and still qualify. In Texas you only need 175 points to qualify. At this point if you have been diligent to get all the first 40 shots at the close range targets in or within the #8 ring you have scored 200 points and have already qualified. To my surprise, my Aunt Brenda although using this method went ahead and went for the gold on her last 10 rounds at the more challenging 15 yard targets and put all of the rounds within or in the #8 ring! Says something for the Glock 17 she used. If my 68 year old Aunt can do this to qualify so can you. A total of 50 shots are fired during the range qualification test. A score of 70% or greater is required to pass, or 175 points out of a possible 250. Shots are required to be completed within a predetermined amount of time from 3 different distances. The target to be used is a B-27 target which is a human-sized silhouette target that measures 45″ high and 24′ wide. All shooting is from the “ready position” where your firearm is already in position to fire.